The national touring company of Hello, Dolly!, which opens this evening at the Orpheum Theatre in Minneapolis, MN. Photo by Julieta Cervantes. Hello, Dolly! opens tonight at the Orpheum Theatre on Hennepin Ave. Written by Michael Stewart and Jerry Herman, the musical took Broadway by storm in 1964, walking away with a record 10 Tony Awards. That record stood unbroken until the new millennium, surviving challenges from shows like Phantom of the Opera and only falling to The Producers. The show has gone on to become a regional theatre favorite and enjoyed three Broadway revivals. 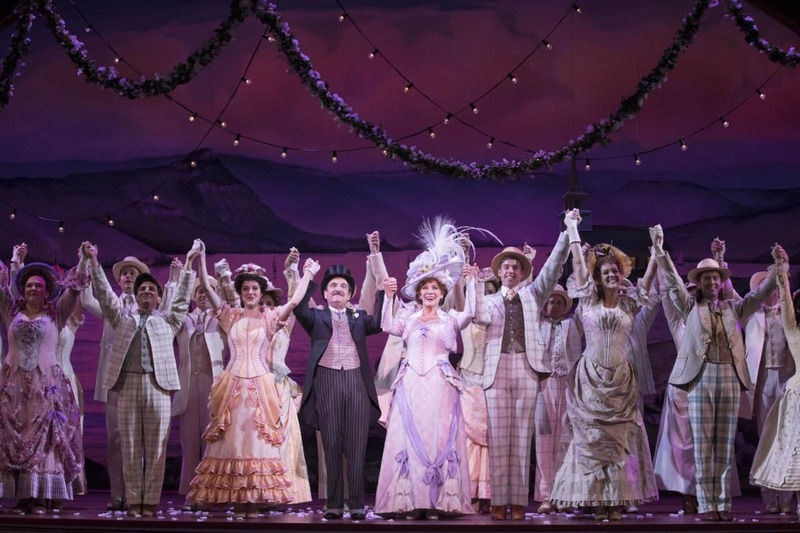 The tour that plays in Minneapolis through April 28 originates with Hello, Dolly!‘s most recent revival, a celebrated 2017 Broadway production that the Guardian called a “riotous delight” and the Chicago Tribune proclaimed “the only Hello, Dolly! you need to see”. Singer-actor Kristen Hahn plays Minnie Fay on the tour. The Arts Reader’s Basil Considine spoke with Hahn about helping people get away with murder (onstage), classical singing, and the merits of baking on tour. Before falling into (or embracing) the sordid world of theatre, do I understand correctly that you developed quite the background as a classically trained singer? Given that there are only so many hours in the day to perform, rehearse, and audition, how do you divide your attention? 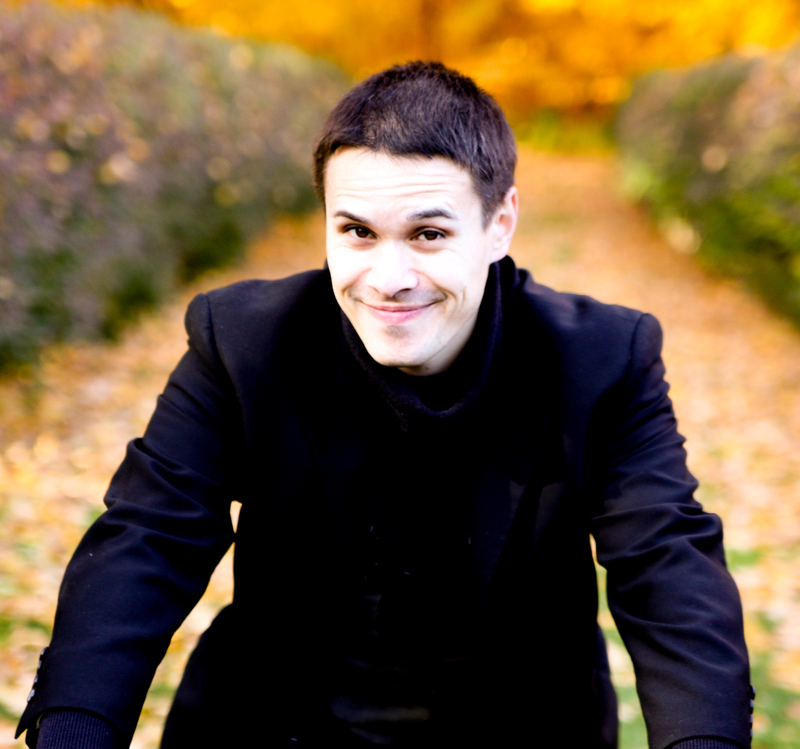 Are you actively pursuing work in both the Classical singing/opera world and musical theatre? The bulk of my time is now directed into musical theatre, but in the future I’d love to delve back into opera and concert music, and work in both mediums. You wore a few hats in A Gentleman’s Guide to Murder‘s Broadway run and national tour. Where did you start and where did you end up? I began on Broadway as a swing, meaning that I was an offstage cover and covered the three Ensemble women roles and the two leading ladies. Later on during the Broadway run, I graduated to an on-stage Ensemble role, continuing to understudy, and then on the National Tour I was a replacement for 7 months as Phoebe. I interviewed Kevin Massey when he came into town on that tour – did your time overlap with his? Yes! Kevin Massey was my Monty, and I love him to pieces – just such a kind man, and a joy to work with. Did your Classical singing background factor into your casting in that tour? Certainly Phoebe D’Ysquith has more operatic writing than some of the other characters that you covered. I think everyone in the show – all the women – all had Classical training and were really stellar singers. I think that we all had to be involved in a more “legit” way to sing in order to be involved with The Gentleman’s Guide to Love and Murder. Roughly how long did you spend with the Broadway production and the national tour, respectively? I was in the Broadway company for just shy of a year – about 11 months – and on the National Tour for its final seven months. The final casting tour for the Hello, Dolly! national tour was announced back in August 2018. When did you first get cast? I was cast a few months prior to the announcement. Needless to say, I was overjoyed and couldn’t share it on social media, but was able to tell my family and celebrate with them. Who were the first people that you told about being cast? I remember calling my parents’ house and hoping to catch them both on speakerphone, but my mom was out…so I told my dad, then called my mom on her cell, and then called my sister and her husband. I wanted to tell them all at once, but it’s sort of fun how it worked out that way. Some processes are quite long, and others not as much. Mine took place over the course of a week; I went in 2 or 3 times for the team and ended up getting cast. How long have you been on the road for the Hello, Dolly! tour? How long does your contract run? I think it’s been about 6 months. We’re about halfway through the tour; we’re all contracted for a year so far. Beyond that, we’ll see what happens. The tour definitely has dates being booked beyond that first year, which is very exciting. Many veteran touring artists get their travel packing down to a high art. Besides the normal clothes and toiletries, what are your must-haves in your travel kit? For me, definitely some health supplements so that we can stay healthy despite being on airplanes a lot during the winter months. I also have my personal steamer for steaming my voice and my throat. The touring company provides us with trunks that we can put larger items in, so I’m able to carry some cooking supplies. I can’t live without my olive oil, so I travel with that, plus cinnamon and vanilla extract for baking. I also bring a small pot and a small pan; some people bring blenders or Vitamix food processors, but I don’t have those. The cast that tours together, tours the city together. A major plot point of Hello, Dolly! involves characters skipping out from work to tour the city. Matinée days excepted, the cast of the national touring company of Hello, Dolly! (pictured) gets to spend their days touring the cities that they visit – no daytime skipping required, just showing up in time for call. Photo by Julieta Cervantes. Are there any items that you packed on your first tour that you’ve shed to make room? You’re currently with the Hello, Dolly! tour in Denver. What have been some of your favorite touring stops and why? Absolutely. I’ve never been to Minneapolis, so I’m looking forward to coming there, but I really love Greenvile, South Carolina – it’s an adorable little town. I love Denver, too, with the mountains as a backdrop. Chicago is also a favorite. Denver’s altitude takes a little getting used to. Is there any special preparation or advice that the tour managers give as you head to different climates and such on the tour? We were all encouraged to up our water intake (which we’ve all been doing), and the theatre has oxygen in the wings, in case we need it. Your character in Hello, Dolly!, Minnie Fay, is something of an ingenue role: a touch naive, strait-laced, hasn’t been around and about too much. 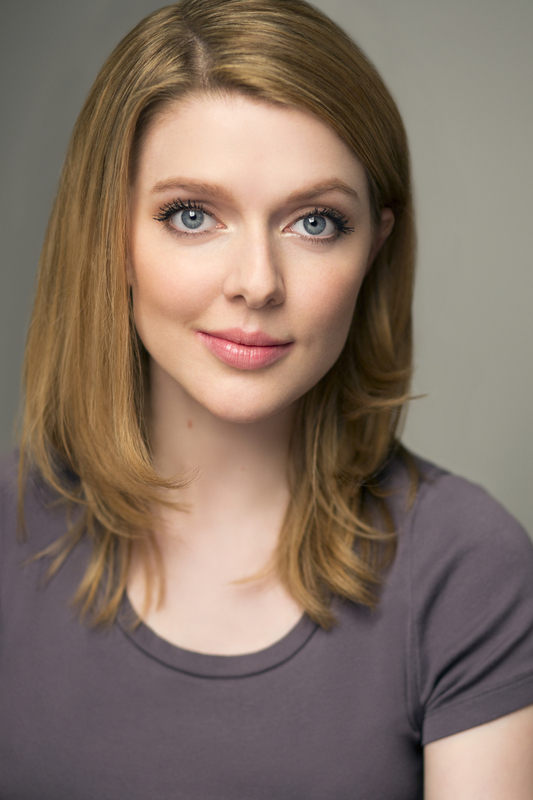 Some other roles you’ve played in recent years include Sergeant Sarah Brown from Guys and Dolls, Phoebe D’Ysquith in Gentleman’s Guide…is this a deliberate character focus that you’re pursuing, or just where the casting has been landing? Although on paper they’re certainly ingenues, they all bring a bit of a different life experience to the table. Minnie is the youngest of those characters that I’ve played, so she’s probably the least experienced of the three. It’s fun to find the differences between these ladies; upon examining the script, it’s also fun to find how these women are different and not so naive, to find the strengths within them. Sarah has some life experience and she’s wary. I think ingenues sometimes get a bad rap for being too naive or “vanilla”, but I’d argue at the end of the day that every character could potentially be a character. In life, we all have so many dimensions to ourselves. Certainly, my age and voice type lend themself to that role, but I find them to be very dynamic and different. Has your portrayal evolved significantly during the tour? I feel that, more than anything, I’m more comfortable in Minnie’s skin and I feel that it’s a little easier for me to find myself flowing into her at the beginning of each night, as we get on the proverbial train ride. At first, it takes a while to get acclimated and acquainted with the other person that I’ll be inhabiting, but as time goes by I find it a little easier to shapeshift. Because of this, I think that playing the role for this long frees me up a little bit to delve deeper into developing her mannerisms or incorporating them into my physical life as actor. Pretty much every traveling actor that I’ve interviewed has a special project that they’re working on – songwriting, recording an album, prepping a prestige project…what do you like to do to fill your downtime (such that there is) on this tour? I have been better about reading (which has been lovely), and I love to cook. I also love to get out into nature, which I find really restorative and inspiring in terms of filling a creative well. Being in Denver has been great because we have the chance to venture out during the day into the mountains and go hiking. None of those are necessarily part of the arts, but it makes for a well-rounded life experience. Some tour casts get very close, to the point of exploring every destination as a massive group. What are things like when your touring company goes on an outing? I would say that it varies – a lot of times, just because of where we all end up living. In our last visit, most of the cast was in the same hotel, so it was very easy for us to coordinate and meet at one point to do things together. In Denver, however, we’re a little more spread out and a lot of us are in AirBNBs – so we sometimes end up branching out in smaller groups. This case is a wonderful, genuinely kind group of people, so whoever you end up venturing out with that day is going to be a great companion. Is AirBNB normally a housing option? The company manager provides us with two hotel options, but we can also choose a buy-out per diem and put that towards an AirBNB. I often take the option because I love cooking, but we’ve been fortunate on this tour to be provided with many hotels where the rooms have a kitchenette, which is definitely helpful. It’s probably an even mix which one I pick. What’s on your recent reading list? I’ve been having a lot of fun with books that discuss the behind-the-scenes creative process in terms of making musicals. I’ve been really enjoying The Street Where I Live, which is by composer Alan Jay Lerner and tells his accounts of writing and working on Camelot, My Fair Lady, and Gigi. Another is Meredith Wilson’s He Doesn’t Know the Territory, which is about his writing The Music Man. What’s a particular favorite of yours in Hello, Dolly!? I have two of them. The first is a number in Act I called “Dancing”, where pretty much the whole cast is involved in this really jubilant number about connection and falling in love and finding joy – about daring to do something that you’ve never done before. It all take form in this beautiful choreography and it’s one of my favorite numbers. In Act II, there’s a number in that I love to listen to even though I’m not actually in it: the title song “Hello, Dolly!” – when the leading lady comes down the stairs in her red dress and converses with the waiters and everything. It’s joyful, it shows the resilience of the human spirit, and I just love to hear the audience’s reaction to that. It really brings them to their feet. Are you listening or watching from the wings during “Hello, Dolly!”? Technically, I’m onstage at that moment, but behind a curtain. Four of the supporting characters (myself included) are in a little pod, a private room in the restaurant that hasn’t been revealed, yet. 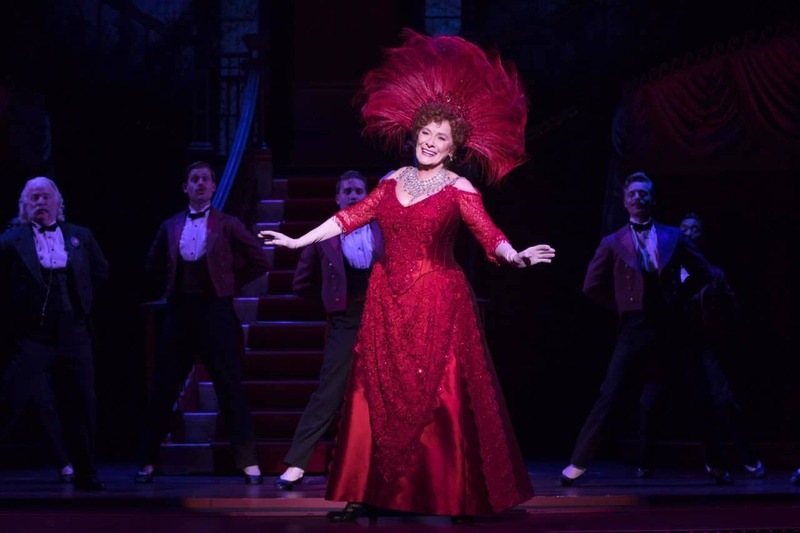 The staircase, the dress, and the spotlight: in one of Kristen Hahn’s favorite moments in Hello, Dolly!, leading lady Betty Buckley descends the stairs in a red dress for a featured song. Photo by Julieta Cervantes. Hello, Dolly! plays through April 28 at the Orpheum Theatre in Minneapolis, MN.